Featuring Alfie Watson, Alfred Willer, Clara Willer, Daniel Willer, Dylan Watson, Flora Fanelli, Marina Willer, Marcello Willer and Stuart Watson. Narrated by Tim Pigott-Smith and Marina Willer. Script by Marina Willer, Brian Eley and Leena Telèn. Distributed by Cohen Media Group. 80 minutes. Not Rated. It is not easy to find new ways to look at a subject as widely explored as the Holocaust. 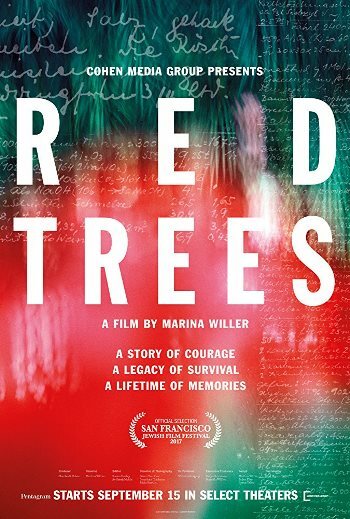 Marina Willer’s Red Trees mixes her Jewish grandfather’s journal entries about life before, during and after World War II, with some moody photography by three cinematographers, including César Charlone (City of God), which gives the film an eerily isolated feel. This is certainly different than the in-your-face violence and drama of most films about the war. Some sections – like a stunning look at the abandoned Terezin concentration camp and a long-forgotten Czech warehouse in which dozens of shoes, coats and aprons hang forgotten from the roof – are spookily gorgeous. However, too much of this is merely eerie, or even quietly beautiful, which has a tendency to overshadow the horror of the subject matter. Even the story itself seems a tiny bit tame. While in parts, her family’s story is harrowing and even tragic, in the long run they had it relatively easy in comparison to most Jews. Her grandfather, luckily for the family, was a respected scientist whose proprietary chemical knowledge made him invaluable to the Nazis, and kept him and much of his family out of the concentration camps (though they feared they were about to go into the camps right as the war came to an end). Yes, they lost friends and loved ones and lived through some horrifying days, but they came out of the war in much better shape than most. It’s not fair to blame their story upon them, and the fact that they were some of the few lucky ones who survived does not make their story any less valid. However, occasionally the film feels a little bit arty for a subject which is so horrifically ugly. Nonetheless, the look of the film is gorgeous and much of the grandfather’s story is intriguing. Red Trees is a beautifully moody look at one of the most horrific experiences in recent history. It certainly isn’t the first documentary you should go to if you want to learn about World War II and the Holocaust, but it does give an interesting take on the experience. Tags: Alfie Watson, Alfred Willer, Brian Eley, César Charlone, City of God, Clara Willer, concentration camp, Daniel Willer, Dylan Watson, Flora Fanelli, Jay S. Jacobs, Leena Telèn, Marcello Willer, Marina Willer, movie review, nazis, PopEntertainment.com, Red Trees, Stuart Watson, Terezin, The holocaust, Tim Pigott-Smith, world war ii. Bookmark the permalink.